You can use the GUI application VeryPDF Image to PDF OCR Converter and the command line application VeryPDF Image to PDF OCR Converter Command Line to convert the image of GIF to searchable PDF document. This article will put emphasis on two solutions about this conversion in following contents. The first solution is to use the GUI application to make the conversion and the second one is to use the command line application. Before knowing how these two application work, you need to download them at http://www.verypdf.com/app/image-to-pdf-ocr-converter/index.html. When using the GUI application, you need to install it on your computer by double clicking the setup file. When using the command line application, please unzip the ZIP file and then it will be runnable. Please open Image to PDF OCR Converter at first and if you have created an icon for the application, you can directly double click it or right click the icon and click “Open” option in dropdown list. If not, please click “Start”—“All Programs”—“Image2PDF OCR v3.2”—“Image2PDF OCR v3.2” to open the application. In the opened main interface of the application, you need to add GIF image into it. The most convenient and easy way is to drag the file you need and drop it into the file list of the application which is shown in Figure 1. Then please click “Setting” button to open “PDF E-Book Maker-OCR Version” dialog box in which please click “OCR” tab of the tab control and you need to check “Use OCR” option to activate OCR function. Then click “OK” button. 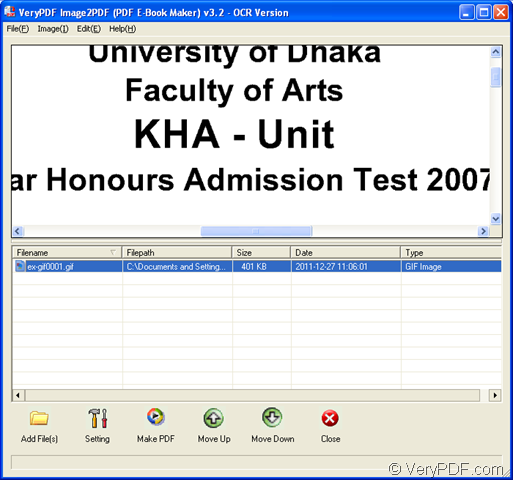 If you have set done all the parameters, please click “Make PDF” button and click “convert selected 1 file into pdf file” option in popup floating item. Then “Save as” dialog box will appear and in it you need to set the output location and edit the name for output file. Solution 2. Make the conversion with command line application. At the beginning of the conversion from GIF to searchable PDF, please open MS-DOS interface by clicking “Start”—“Run” to open “Run” dialog box in which you need to input “cmd” in “Open” combo box and click “OK” button. Then you will see the interface in which you are able to input the command line on your screen. Please see Figure 2 which is a snapshot of a successful running command line example in MS-DOS interface. "C:\Program Files\image2pdf_cmd3.50_ocr\img2pdf.exe" -x 1 -o C:\FILEA.pdf "C:\Documents and Settings\admin\Desktop\demo\ocr\ex-gif0001.gif"
"C:\Program Files\image2pdf_cmd3.50_ocr\img2pdf.exe" is to called the called program img2pdf.exe which is the executable file in Image to PDF OCR Converter Command Line. -x 1 is in order to create searchable PDF document. -o C:\FILEA.pdf is for setting path for target file. "C:\Documents and Settings\admin\Desktop\demo\ocr\ex-gif0001.gif" is the path of source file. If you don’t want to input a long path into MS-DOS interface, you can drag the file you need and drop it into the window. Then you will find that the file will turn to its absolute path at once. If you have finished to input the command line, please hit “Enter” button on the keyboard to run the conversion from GIF to searchable PDF.